Seven Seas needs no introduction. I am sure each one of you must have heard of them or used their supplements at some point. 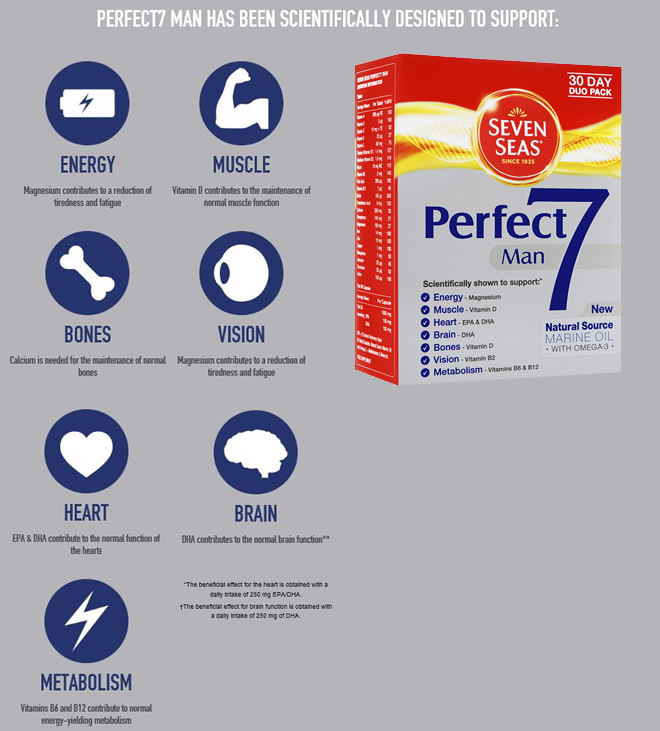 And for those of you who may not have heard about them, Seven Seas are a leading supplier of branded vitamins, minerals and supplements, with their products being sold in more than 100 countries worldwide. 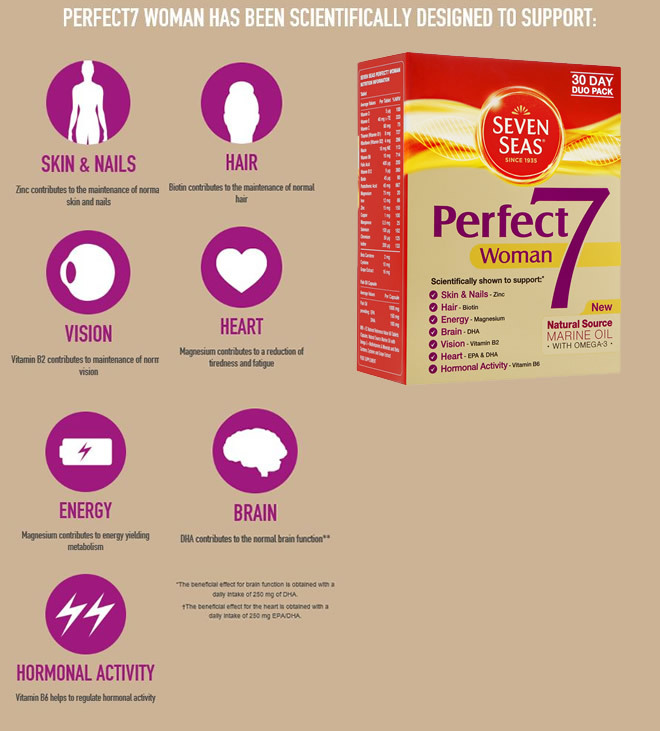 The nutrition experts at Seven Seas have identified 7 key needs for men and women and developed those into Perfect7 Man and Perfect7 Woman. These supplements are a blend of Natural Source Marine Oil with Omega-3 plus essential multivitamins and minerals. 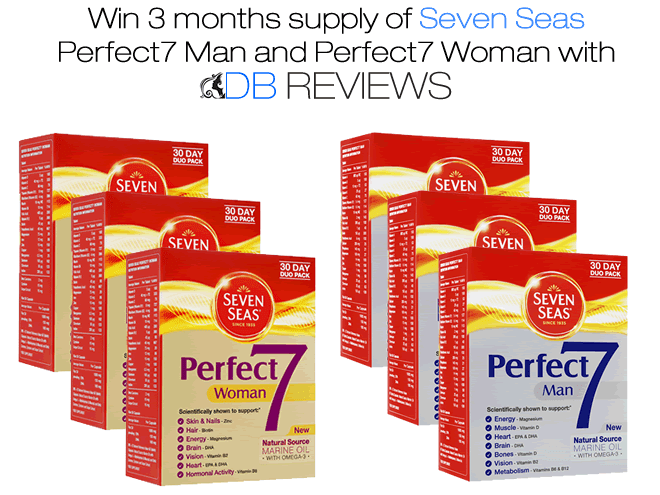 Do you fancy a chance to win 3 months supply of both the men's and women's supplements? Bundle value £59.94 (£9.99 x 6). Simply enter using the Gleam giveaway app below. Disclaimer: Food supplements should not be used as a substitute for a varied diet and a healthy lifestyle. Please consult your GP if you are unsure whether you can take supplements. And always read the label carefully before using or consuming any products/supplements. I take quite a lot of vitamins and supplement as I'm not convinced I get everything I need from my diet. I take breastfeeding vitamins as I have been breastfeeding for a long time and don't want my body missing out anything. I did when I was pregnant and breastfeeding, but I am one of those people who has too much going on to remember to buy vitamins at the shops! We take cod liver oil tablets daily, to help joints now we are getting older. I take multi-vitamins each day, as I believe it can't hurt to be topped up to a recommended daily allowance of the building blocks of the human body. Vitamin C to ward of colds. I take royal jelly, keeps me youthful! I take multivitamins every day, just to make sure I'm getting enough of all the right nutrients. I find it really helpful to take them when I'm travelling and don't have control over what food is available. I take Vitamin C all the time and up my intake of B vitamins and D3 in the winter months. I take Vitamin C to help my immune system. I take B12 & Vit D as was diagnosed as deficient in both earlier this year. Not since pregnancy :( mainly because I haven't found the right ones! Hopefully these will be they sound too good to be true! Not since pregnancy. I haven't found the right ones but maybe these will be!